Lufthansa Systems relies on Axinom’s competence for the development of the award-winning in-flight entertainment system (IFE) BoardConnect..
SF Anytime (Bonnier Group) provides the best of Hollywood blockbuster movies and series protected by Axinom DRM in the cloud. At any time and on any device. Highly scalable multi-DRM service in the cloud built on latest standards including MPEG-DASH, Common Encryption and Encrypted Media Extensions. 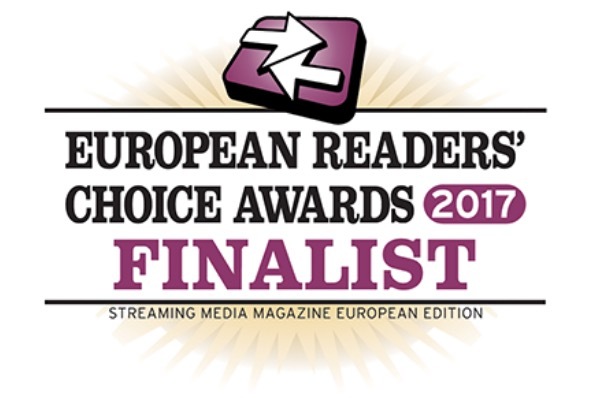 The finalist in “2016 Streaming Media European Readers’ Choice Awards“. Robust and highly scalable multi-DRM service built on latest standards including MPEG-DASH, Common Encryption and Encrypted Media Extensions. Featuring Microsoft PlayReady and Google Widevine. Axinom DRM 6 is the finalist in “2015 Streaming Media European Readers’ Choice Awards“. Axinom DRM is highly scalable multi-DRM service in the cloud built on latest standards. It supports Microsoft Azure and Amazon Web Services (AWS) cloud deployments out-of-the-box. Axinom DRM enables on-board entertainment scenarios in planes, trains, busses, and ships. It is the first multi-DRM product that can operate in a disconnected fashion enabling premium video on board of the vessels. Axinom is providing access to best of breed free secure players for Microsoft Windows and Apple OSX and the majority of popular client devices – tablets, mobile phones, game consoles and Smart TVs. (Microsoft PlayReady, Google Widevine, and Apple FairPlay Streaming). Axinom is named one of the 101 companies that matter most in online video! The magazine Streaming Media Europe published their annual list of companies with the greatest influence in the streaming media industry. We’re proud to be listed on this distinguished list. Our developer-friendly API allows service providers to seamlessly integrate our DRM service into their products with all the features requested by the customers, like multi-channel audio and subtitles. Axinom DRM is developed by developers who actively worked in customer DRM projects for years. For maximum availability, scalability, and performance Axinom DRM supports zero-downtime maintenance and a globally distributed cloud-deployment spanning several public cloud providers. Axinom’s customers enjoy guaranteed availability of 99.99% and global support 24/7. Most platforms have a native DRM technology that can be used for video playback with minimal effort. The use of 3rd party DRM technologies in an app often incurs a technology licensing fee which can be avoided by using the native technology. As a result, a modern premium video architecture is generally based on multi-DRM principles, optimizing for best platform coverage at minimal licensing cost. Axinom DRM is built from the ground up to target multiple DRM technologies in a uniform manner, enabling you to target a wide range of platforms without technology licensing fees and without significant additional software development. The DRM technologies currently targeted by Axinom are Microsoft PlayReady, Apple FairPlay Streaming and Google Widevine, with more being considered for the roadmap. Over the last years a great deal of standardization has taken place in the content delivery and protection field, leading to the Common Encryption (CENC) and Dynamic Adaptive Streaming over HTTP (DASH) international standards that form the underlying pillars of a modern premium video solution. Axinom DRM provides the maximum benefit for solutions that follow these specifications, enabling wide platform coverage to be reached without significant additional costs. It is a service that aims at the future, providing leading edge capabilities to satisfy content owner requirements and provide additional value to you. To support existing solutions in a flexible way, backward compatibility is preserved for many previous-generation architectures and capabilities exist for integrating Axinom DRM into an existing product that was previously not DRM-capable. The choices available in the field of players are often numerous and there are multiple players available for many modern platforms. The capabilities of different players are greatly variable, not only in the field of DRM but also when it comes to playback capabilities and features. A multi-DRM service gives you the confidence that you will be able to use the best player for the job, regardless of the DRM technology it uses. Axinom has experience integrating different DRM-capable players into modern multiplatform solutions and can offer any relevant app development, consulting and integration. A thorough research and player comparison effort is usually desired at the start of any project, leading to a proof of concept with the most favored player that best matches the solution feature set. The delivery and presentation of premium video content involves many factors, of which DRM is merely one. Axinom is an end-to-end solution provider who parnters with various companies to fulfill all the different aspects of a project, enabling the final result to be tailored specifically for your needs. We are able to integrate both in-house products, custom developed code and third party components into a solution, always taking into account the optimal path towards your goals. The technology showcases on our website display the integration with products and services of some of our technology partners who offer web-oriented functionality. Naturally, the landscape of video entertainment solutions is diverse and there are requirements that are too specialized to demonstrate here. Axinom’s wide network of technology and R&D partners enables your needs to be met even if highly challenging. Do not hesitate to contact us for personalized consulting and advice. For our customers it is important to reach the broadest possible audience with the best possible user experience. Therefore it is important for us to support multiple DRM technologies. Client device platforms like TVs, PCs, tablets and smartphones in many cases work best with the respective platform’s native DRM technology. At the same time, using a non-native DRM system on client platforms often leads to subpar user experience and even may incur additional licensing costs. Axinom DRM 6 solves this out-of-the-box.